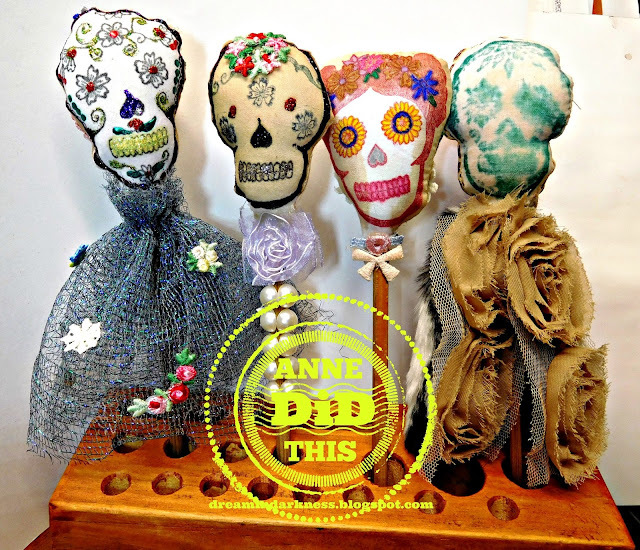 Dream In Darkness: Bouncing Skulls and SinCity Stamps Sugar Skull Blog Hop! Bouncing Skulls and SinCity Stamps Sugar Skull Blog Hop! Welcome to Dream in Darkness! Today we are joining in with the Sin City Stamps Sugar Skull Blog Hop! We're happy to stopped by and Asylum Anne has some bouncing skulls to share below! But first a few deets on the Hop! Sin City Stamps is having a blog hop so that you can meet all of our Inspiration team members along with a few guests, that's us! Also, have a fabulous play with the Sugar Skulls stamps designed by Sin City Inspiration Team leader, Michelle Frae Cummings. We want you to discover more ways to create with these stamps and possibly win a set for yourself! 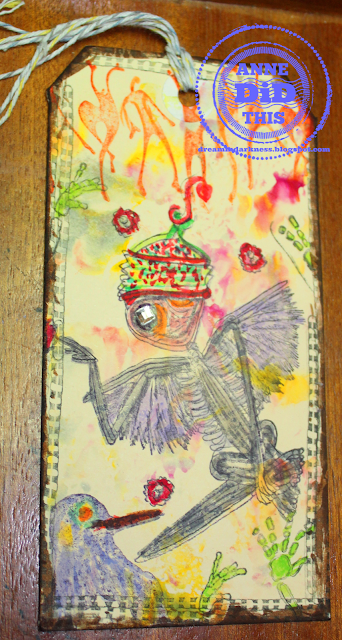 No matter where you have started, to qualify to win your own Day of the Dead Sugar Skulls stamp set, (we are giving away 3!) we ask that you visit each of the blogs participating, leave a nice comment and then come back to the Sin City Blog and let us know which blog projects you liked the most and why. 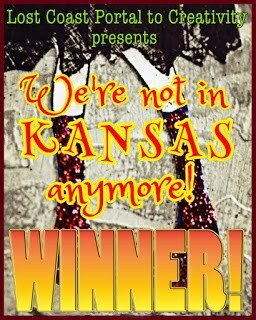 The blog hop will end on the 27th and the 3 winners will be announced on the Sin City blog and on our FB Fan Group on March 28th. Well that sounds a bit unkind... are we in a bowling alley? 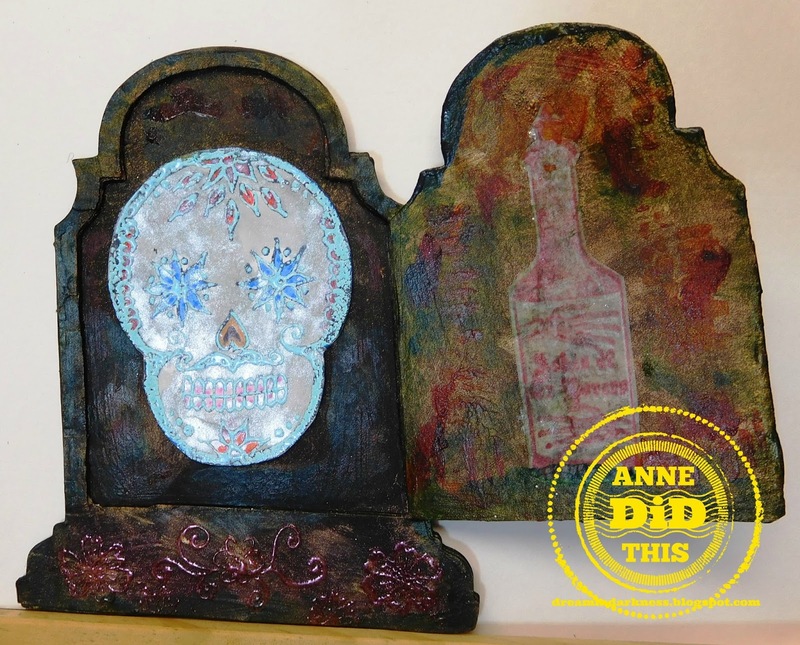 Asylum Anne has hijacked the Dream In Darkness blog today, to join the Sin City Skull hop. I stacked 4 layers of the Sizzix tombstone, removing the centre panel of the middle 2 layers. I have a habit of disguising a "grubby" background - which is part of a cereal packet -, as well as around the bottle of ashes, using Seth Apter's Explore stencil - with "unsettled" it seemed an appropriate one to use. I've also been playing with Marottes again. To quote Wikipedia, "A marotte is a prop stick or sceptre with a carved head on it. Jesters usually used a marotte. The word is borrowed from the French, where it signifies either a fool's (literal) "bauble", or a fad/craze." So here are my crazies, settled onto chopsticks. They all started by being stamped with Stazon onto an old bit of cotton sheet. They were then embellished - coloured in with Bic alcohol pens, or over-covered with stickles and kindyglitz. And wee flowers hot-glued to the fabric. The far right marotte is an anomaly - you're looking at the back, which has the stamped image done in a dye ink on the INside of the fabric. So it already looked faded, and subsequent spritzing caused the dye to run and blur. Who would believe that inside this faded sad creature is(was) a wild animal! Perhaps a werewolf. A gusset of leopard-print elastic where the front & back seam is, wraps round her neck as well, and she's gone from tattered faded beige to animal fur too. The backs of the middle two have some of the small stamps on the skull plate inked. 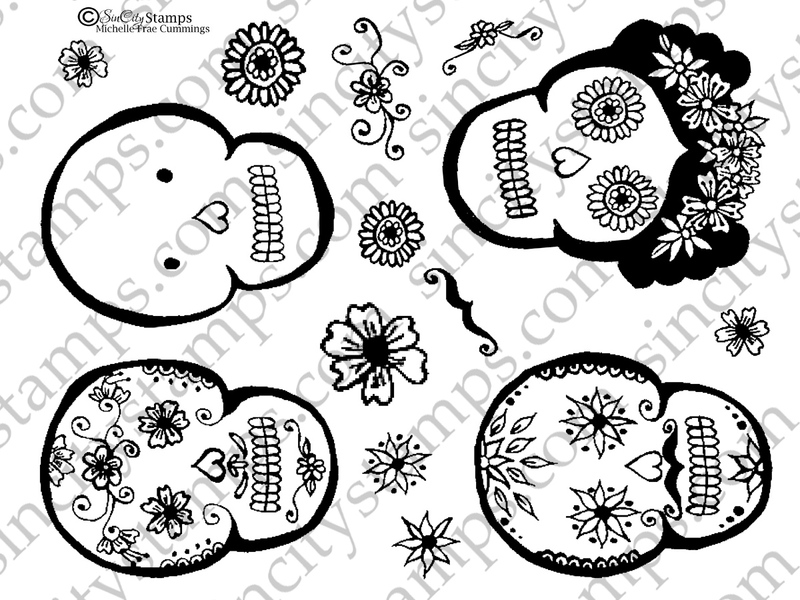 The sugar skulls and flourishes come from Sin City Stamp's Skull sheet. Around the world, we are disrupting our body rhythms by indulging in clock-changing. Springing forwards, falling back... Clocks and watches all get mucked about, and end up a few minutes different, or forgotten about and are an hour out. But a stopped clock is right twice every day. And this watch will be right.... once in a lifetime. There is a small hook (off a suspender aka garter belt) at the bottom, that hooks into the braid at the top end, to sit around the wrist. Stamped on tyvek is the Skull with Crown Crow and Spider. 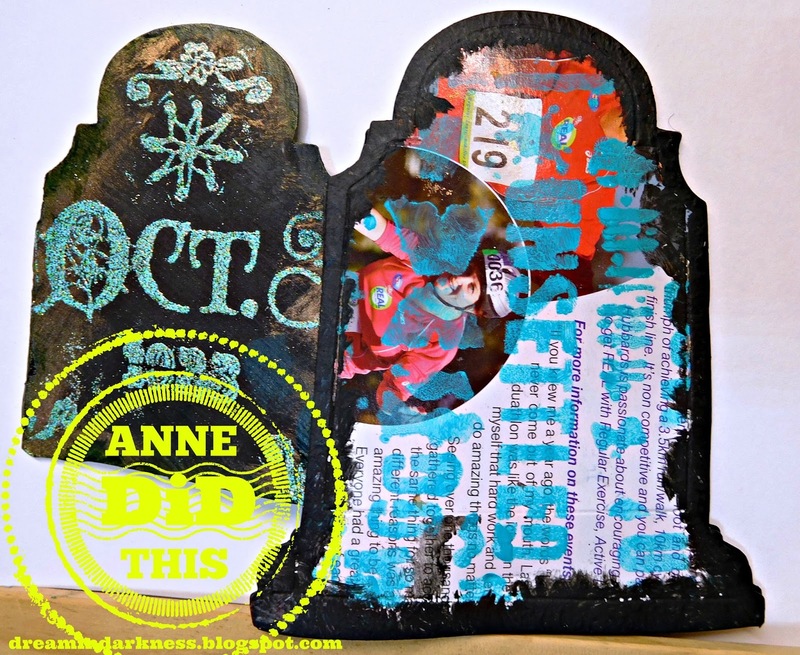 Carry on with the Blog Hop and be back here later in the month for more fun with this month's sponsor, Sin City Stamps. Scroll back up to the top to get your next stop! Don't forget to leave some comment love at each blog to be entered for a chance to win this sheet! OMG what amazing creations and I HAVE to do fabric heads and make them into dolls - they are amazing!!!!!! My gracious Anne - you have been on a CREATIVE HIGH here!!! All of these projects are just SUPER. The Marottes are my favorite and WOW - the back sides are almost more FABULOUS than the fronts!!! On what an AMAZING tombstone idea. And you stopped time too! This was a fun stop on your hop!! Thanks bunches. j.
Oucha....that is some project and wow love it. Wowzer... I love the Headstone with the Skull and the Ex's Ashes! How dark and grungy! Love the Marottes and the Watch are awesomely cool!!! You Rock!!! What pretty skulls stamps, cute. Truly amazing what you have done with my stamps! 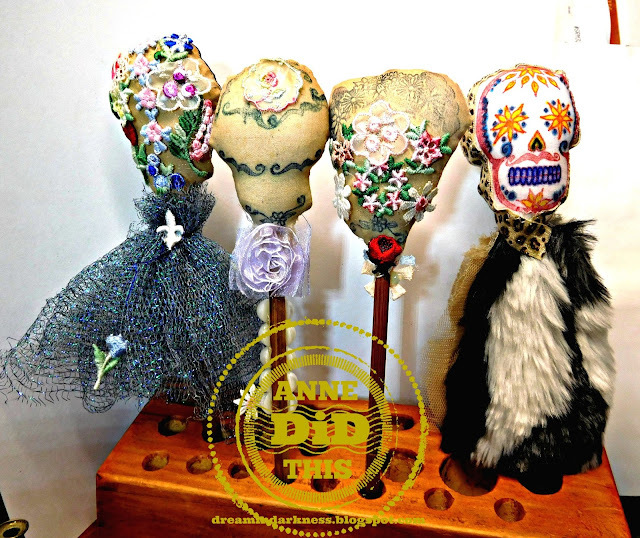 Love, love, Love the doll head idea's! Thanks Michelle, they're a great size to work with that way. I love your Marottes! I love how you used both the skulls and the flowers on them. Oh, Anne! You got me with the marottes! Love them! 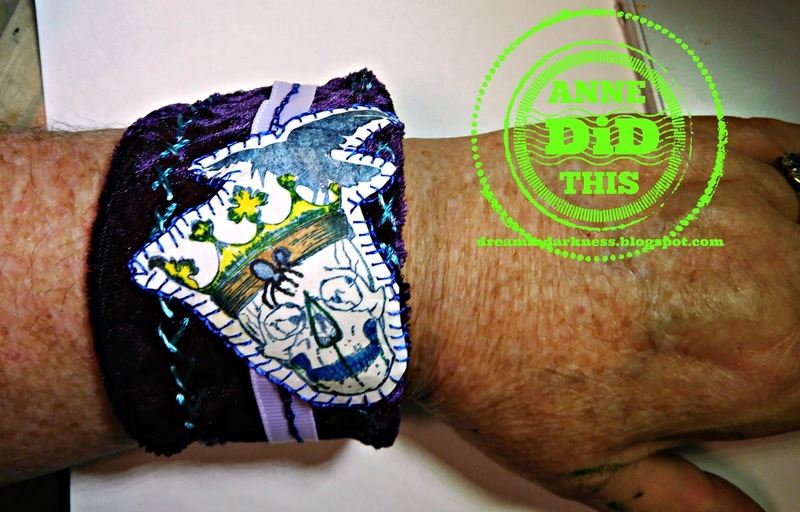 Great idea to stamp on fabric...super projects! 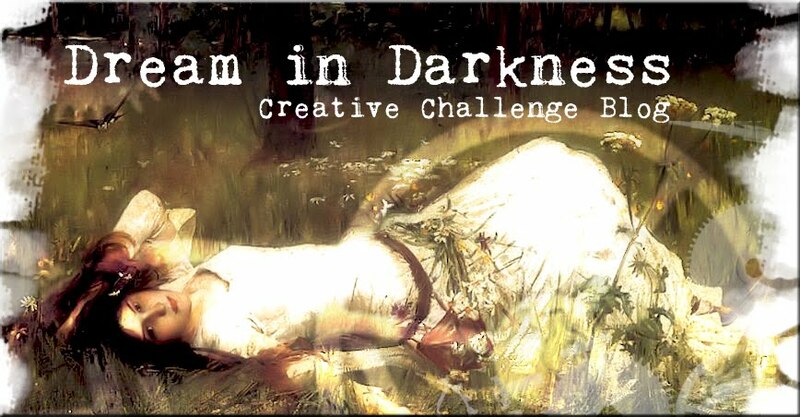 :) I really like the dark challenges with the bit creepy and interesting touch of dark dreams :) as well as the skulls-tamps :). The blog hop is a wonderful idea and the prize amazing :) - so I try my luck! All 3 ideas are great and wonderful individual realised. 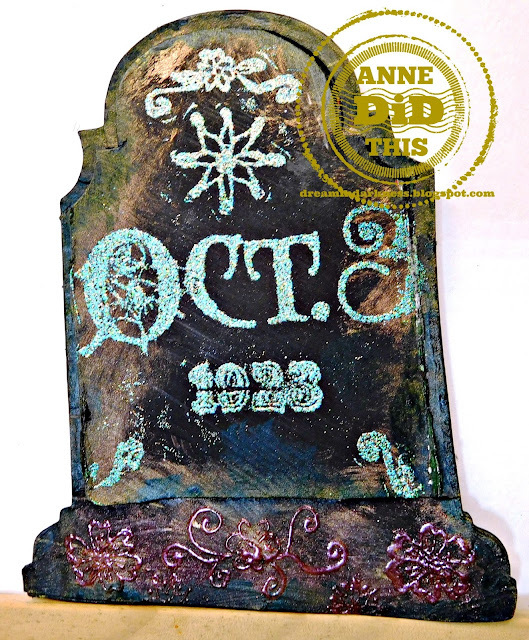 To stamp on material has an amazing effect! The darkness is wonderful framed gravestone (great idea to open it :) - wondeful colors!!!) as well as the colorful project as dolls (fantastic!) or as wristband (fabulous and proctical!). Cool projects! You make me wanna play with dolls - OK they are skulls, but boy would it be fun to play with them. Awesome set Anne, love the back of their heads as well. 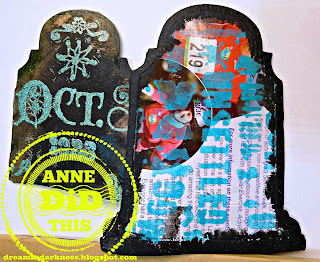 Day of the Dead and Sin City Stamps! March Challenge and Great News!